This site has a page with Alligators information and CD ordering with a credit card as well as other music, books, etc. This site has a page with Alligators information and CD ordering with a credit card as well as other independent music, etc. Bruce Marshall is a frequent performer in The Acoustic Alligators. In addition to having his own band (The Bruce Marshall Group), Bruce is a former member of Marshall Tucker’s “Toy Caldwell Band.” Bruce is also currently in the “Montgomery Marshall” Duo with blues legend James Montgomery. A Webpository for information relating to bands, artists, songwriting and Indie music. This site has a page with Alligators information as well as other live music, venues and bands in the Lowell, MA, area. Tom Bianchi is a talented songwriter who plays bass guitar, harmonica and sings. His show is an entertaining and unique mix of funky bass, stand up comedy and clever, funny songs. Alan Goodrich enjoys playing drums for Tom at shows from time to time. Tom also hosts open mics and feature events in the area. A great musician and a very funny guy. Alan Goodrich went to high school with Phish bass player Mike Gordon. Back in high school, Mike’s bands used to open concerts for Alan’s band. My, how times have changed! Even with the huge success of Phish, Mike remains as down to earth and as nice a guy as he was in high school. If you are unfamiliar with the talented musicians that are Phish, click on this link to their web site so you can see what all the fuss is about. Doren is also a longtime member of the “Extended Gator Musical Family.” This is a web site devoted to his musical projects. Honorary Gator and Alligatorsband.com webmaster Matt Lindi designs and hosts web sites, plays guitar, sings, used to run a songwriter showcase called the Rose Room Revue at The Rose Garden Restaurant in Upton, MA, fixes electronics and helps folks to know and love their computer. We’re still trying to figure out if there’s anything he doesn’t do. Rob Huffman hosts a traditional Irish Session Tuesday evenings from 6 to 9 PM. Rob’s CD “Tone Without Tension” features original songs with an Irish flavor as well as folk and acoustic rock. 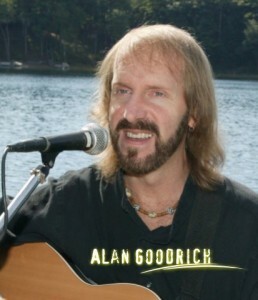 Rob has played guitar in bands with Alan Goodrich that go back to their high school days. Alan and the Alligators have a listing on this site.